Plum trees are regularly grown in gardens in the UK and their fruit is traditionally made into jam and eaten on its own. They can also be made into a fruity wine or dried and eaten as prunes. The trees flower in early spring and cover the tree in blossom. Normally around half of the flowers will turn into fruit but this can depend on the weather. If there is a late frost, the tree could lose all of its flowers, and the fruit set will be lower than normal – you may even not get any fruit at all if the frost is severe enough. If there has been very little rain, the fruit crop will suffer, and you will also get less fruit if it has been too wet. The Greengage is a close relative of the plum. It was developed in France and is small and oval-shaped. Unlike plums, they are green or yellow, and are the tastiest of eating plums. Plum and gage trees are easily grown in the UK and need very little maintenance. If you want to grow your own plums, you will need to consider a few factors before buying your tree. How big do you want it to grow? Do you want cooking plums or eating plums? How many plum trees will you need in order to produce fruit? You can buy plum trees to suit nearly every type of garden. Fan trained trees only grow to a height of around 2m, and a width of 3m. They are ideally grown against a south or west-facing wall. You can also buy free-standing fruit trees, which grow to an eventual height of around 2.5m, and are ideal for smaller gardens, where a fan-trained tree wouldn’t be suitable. Bush-trained plum trees are also an option. They are also freestanding, and grow to up to 4m in height. They are ideal for larger gardens. Growers looking for a really large tree might want to consider growing either a half standard tree (they grow to 6m), or standard plum trees (8m). You will need to use a ladder to reach the fruits from these trees, however. The following guide will help you learn more about varieties of plum tree and the best one for your needs. Some plum tress are self-fertile, which means you will only need to buy one, but many require another tree growing nearby for pollination to occur. If you do choose a tree that requires another variety to cross-fertilise with, choose one that flowers at the same time. 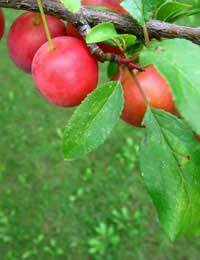 Plum trees are varied and they are a fantastic choice of tree to grow in the garden. With the right conditions, they will produce masses of fruit every year that can be used for a variety of culinary treats. Hi, I planted a Plumtree (Czar) last September and we are now in mid April and it is still not showing any signs of leaves. Is it dead? Or should I wait longer? Hi i have bought a victoria plum tree online and it has just arrived, it looks like a straight stick no branches etc , it is my first time buying one of these, is this how it should look ,it is about 4ft tall , discription said bare root ready to fruit? I bought a plum tree today, Opal, and it has thorns. Is this usual for an Opal plum tree? I bought a mature plum tree from a nursery a year ago. I say "mature" because its trunk is approx. 8 inches in diameter. It produced one plum this summer and then started exuding brown globules of a sticky, glue-like substance. I have had conflicting opinions ranging from "this is normal" to "your tree is dying" from various sources. I'm happy to send you a photograph if this will help. Can you enlighten me? @Keirren -Do a small scratch test.You can scratch the bark of the trunk of the tree, just a small amount. If you scratch away the bark and the wood beneath is not green, then your tree is on its way out or dead. Trees in pots need a lot of water - it could be that you have starved it if you have only given water occasionally. It would explain the sudden loss of leaves. @Cobra - If from the outside the plum looks OK (or there may be a small brown mark on the skin), then it could be the plum sawfly. I have a plum tree in the garden 3 years old and this year when just picking a few off which were ripe they have brown specs inside, I picked some off the not so ripe and inside they are the same, outside no problem They have been watered well during the drout,, can they still be eaten and what is causing this? @Nico21 - The tree has only so much energy to use to produce fruit so thinning (removing some of the fruit) is essential to produce a good crop. But it's usually done earlier in the year and for the present year's crop. My plum tree is covered with fruit for the first time.I have been advised to take off the not yet ripe fruit now to obtain a better yield next year, is this right? @Jan-I'm afraid to say your plum has been invaded by the plum moth and the brown flecks are the excrement of the maggot that may still be resident. (One reason not to preserve plums whole as you may be preserving more than you bargained for). If you aren't put off eating them completely you can cut away the damaged/dirty areas and eat the remainder but it is one hell of a faff! Hi, we have a Victoria Plum tree in the garden, which has these last 6 or 7 years produced loads of blossom but the fruit is very small and purple. It still tastes of plum but they are so small. We live 1/4 mile from Buncefield Oil Depot which blew up December 2005 and before this and for a few years after, apart from 2006, the tree was heaving with fruit. I was giving them away. I do believe that the explosion affected the tree as the following summer the fruit were purple black and small, much as they are now. Does anyone have any ideas please on why it won't produce lovely golden and red plums anymore? Thank you! @Woody - it might be about the variations in the water supply available at the roots. Hard to say really. the most important thing is not to waterlog the tree, but to keep water more constant if you can (if the tree is in a pot). @Kaleem - give it a chance, it'll take 4-5 years to establish itself and properly fruit. Hi I have a relatively new plum terr. Last year it did fruit but not much. This year there is ample fruit but I feel that fruit is not growing in size and compare to my sister my fruit seems to have an arrested growth. Any Idea? @Tanzynia- chop down the tree because of lack of fruit - it's worth keeping the tree for the beautiful blossom and as you say to save a life! Sometimes, the tree just may not like where it is and something about the soil consistency, situation, or the fact it might be a late developer (plum trees usually start cropping when they are four/five/six years old, depending on the rootstock). Or you may be over/underfeeding it. Another possibility is that birds or insects can destroy the flower-centres stopping the tree from fruiting. Cold snaps can destroy fruit. You can tell after bloom if your tree will set fruit if you inspect the ends after blossom drop. The ovary should be swollen with the beginning of the new fruit. If these are absent, there is a problem with initial fruit set. The things you can do to help your tree along are to: make sure there are no weeds and grass at the base of the tree, fertilise well, foods with higher in phosphorus will help with blooming and fruiting (think bone meal). Prune your tree well to prevent disease. No shade. Your fruit tree just needs a bit of patience and TLC and hopefully it will sort itself out. I planted a self fertile Jubilee plum tree in 2011. Although the majority of the tree is healthy the odd branch keeps dying off and we only get about 1 tenacious plum per year. We get lots of blossom and our other fruit trees like the apples are heaving with fruit. The plum tree is about 20 feet away from the nearest apple so I don’t think they are competing for resources. My husband is keen to cut it down as it produces no fruit but I am determined to save it from the saw! Any advice would be most welcome and could indeed save a life! @annie - Hopefully it may come back. In the meantime, do the scratch test. Scrape a twig with a small pocketknife to reveal the layers beneath the bark. A live tree has a green cambium layer beneath the outer bark and green, white or cream-colored wood inside the twig. Dead twigs will be brittle and grey or brown inside. Check several twigs in different parts of the tree to ensure the entire tree is dead. I would suggest waiting another few weeks to see if the tree pushes through some new growth. With warming days, it may still leaf. Good luck. @Nobby - There could be several reasons. Firstly, if your tree is unpollinated the fruit will drop. Small fruits will develop, but not grow. Most varieties of plum tree needs cross-pollination by another tree. Both trees must be close enough together and flower simultaneously. You can get fruit, even if the tree is not pollinated, but there will be no development and they will drop. Plums are sensitive to water shortage, poor weather conditions and disease too. It sounds to me as though they have not been properly pollinated. More investigation is needed. I have a beautiful plum tree that normally fruits in excess of 20lb of plums but last winter it blossomed in October/November even growing a couple of tiny plums, this spring I had no blossom at all and no fruit my tree doesn't look happy with yellowing leaves.Any suggestions on what I can do?